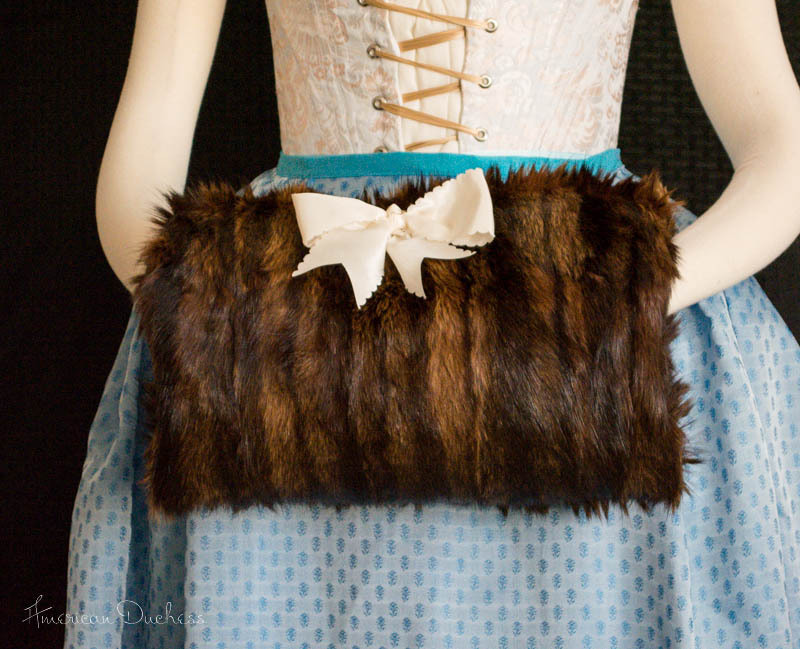 A fur muff. I used recycled sable and it worked a peach. Kept my hands warm too. One very tall and bodacious wig, thanks to the instructions in Kendra's book "18th Century Hair & Wig Styling"
The LACMA Sacque-ma. This was the first Robe a la Francaise I attempted and another project where I did everything wrong but learned so much. 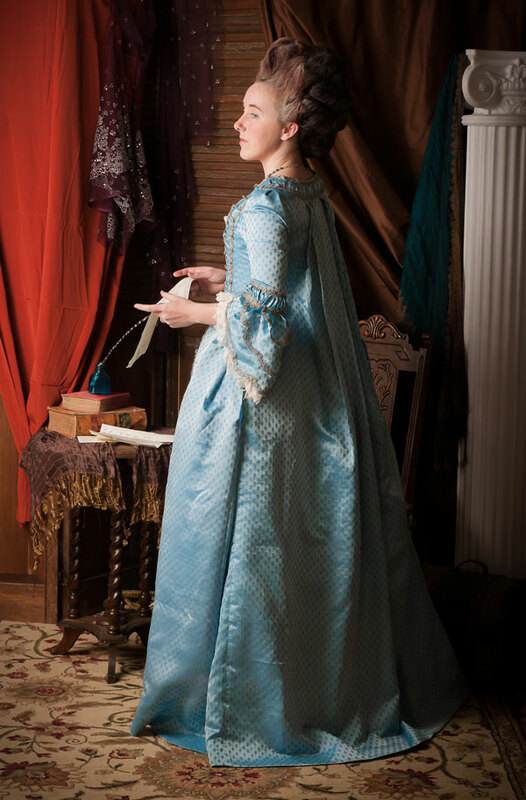 I wore this for a photo shoot, at Colonial Williamsburg, and to the Costume College Gala, but now it's time to refashion the beautiful blue silk into something new, and try try again with a new sacque. 1740s/50s Riding Habit Waistcoat and Shirt. I'm really happy with how this came out, and its overall function, which was to make one of my favorite costumes, the powder blue and silver riding habit, wearable again. I had a couple false starts on the waistcoat, but accomplished it in the end, and the riding habit shirt went together very nicely. A 1950s Dress. 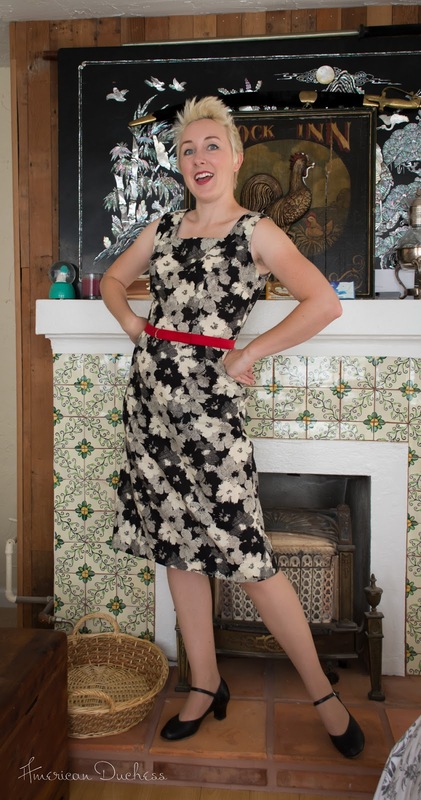 Sometimes I make more modern clothes, like this simple 1950s frock. It was from a pattern I used before, and went together easily, thank goodness! 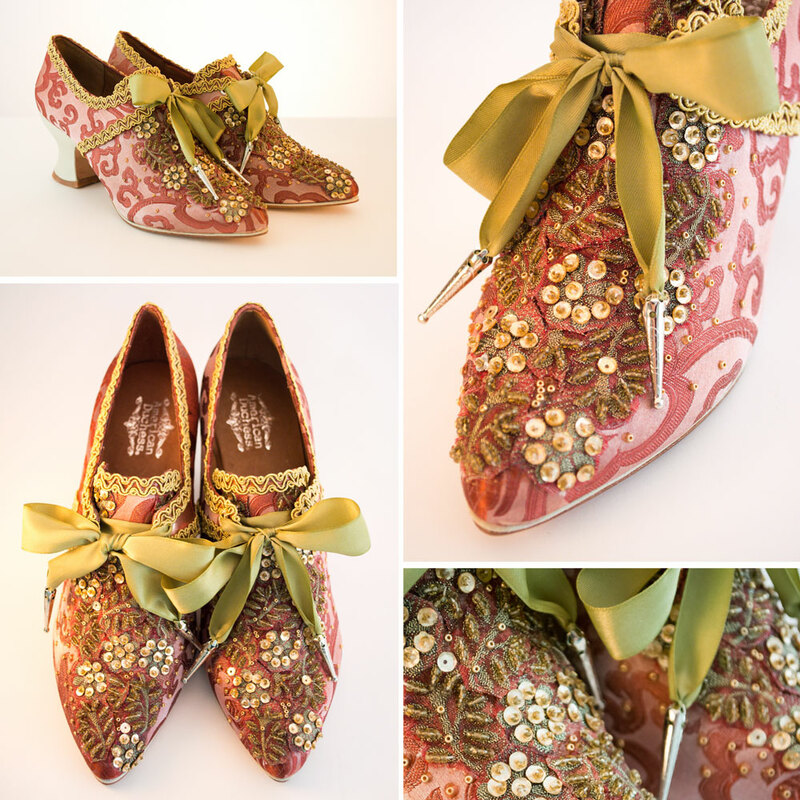 A blingin' pair of custom Pompadours. I'm including these because they went kindof above-and-beyond a normal tutorial, and I can't *wait* to pair these with my future 1740s yellow English gown. 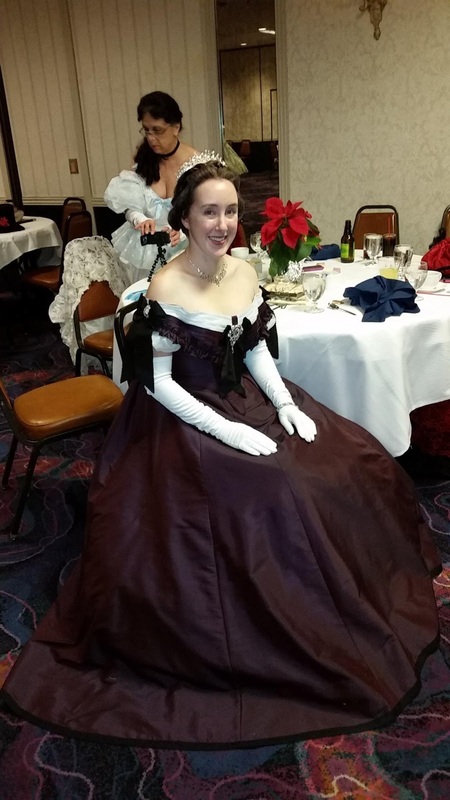 My first 1830s Dress. It's ridiculous and incredibly fun to wear. I've only worn it once, but this one will definitely be making another appearance. I'm hooked on 1830s now! Wearing History "Smooth Sailing" Trousers. I made these in 5 hours and wear them *all* the time. Comfy, dressy but casual. I freaking love these pants. 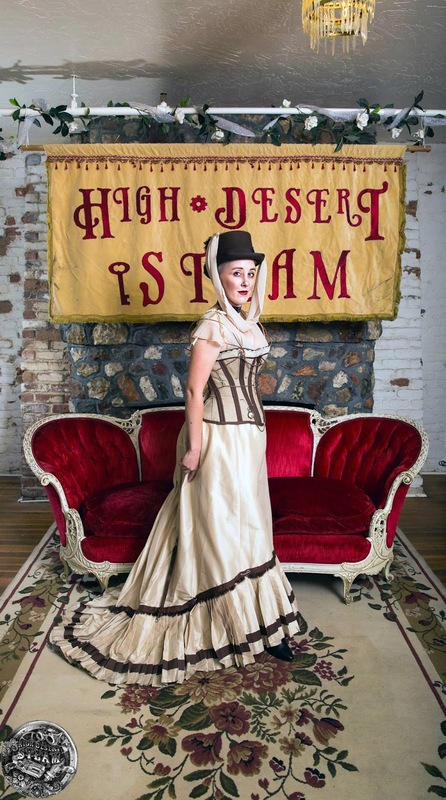 Steampunk Ball Costume. A bit of a throw-together, using pieces I already had, but I made the corset and some "arm bustles" out of copper wire, and managed to win the costume contest! 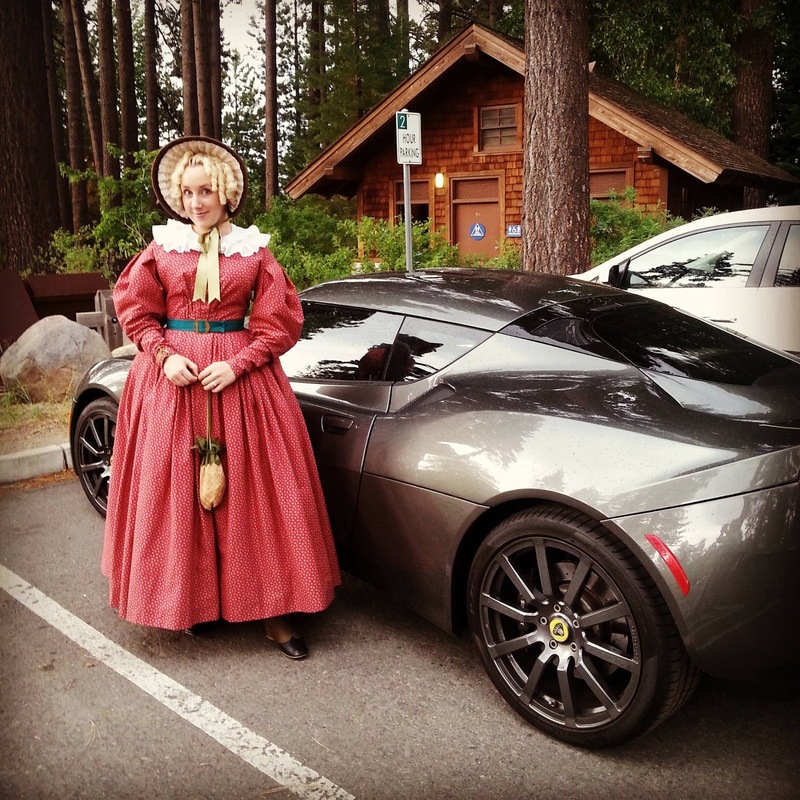 An 1860s Day Dress. I made this from purple silk I bought in China, and love how it came out. 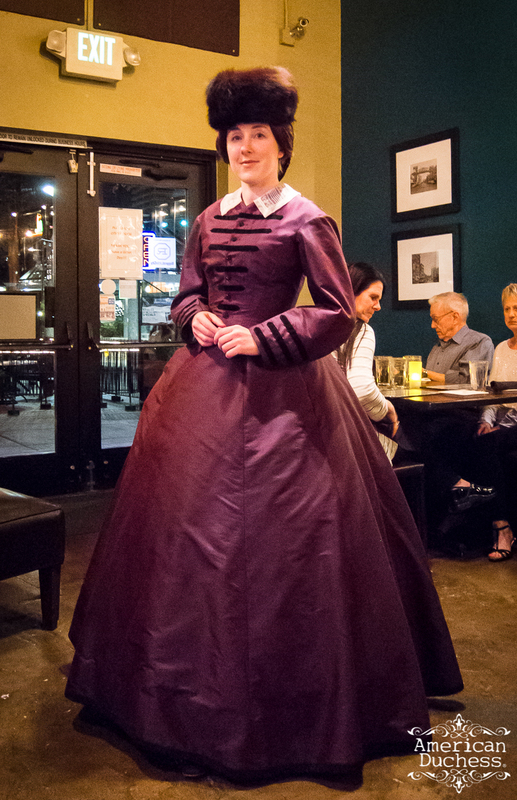 I anticipate it will be worn quite a lot in the future, as my go-to Civil War gown. 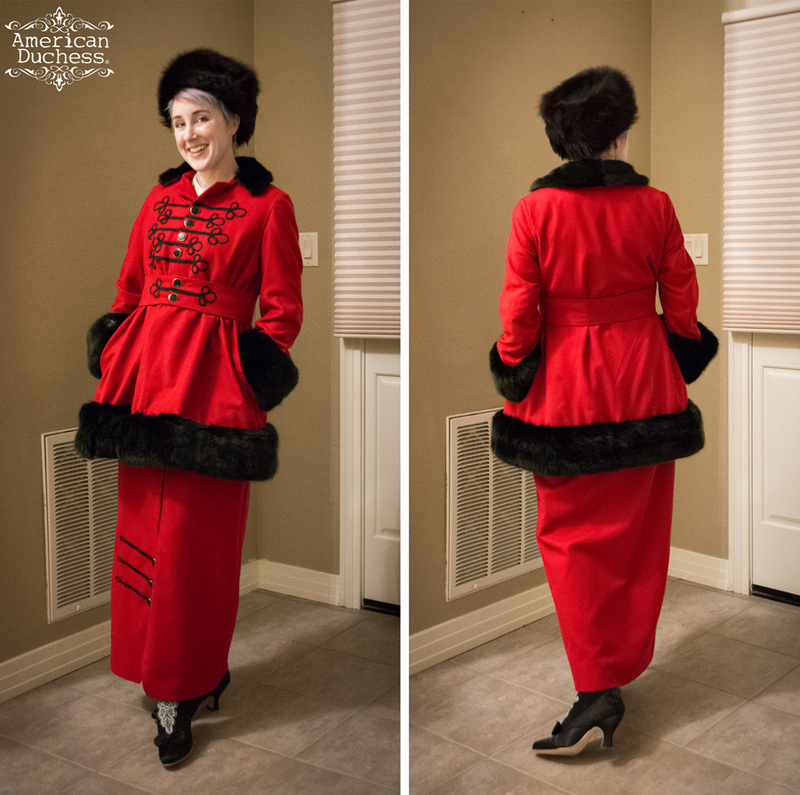 1919 Winter Suit. 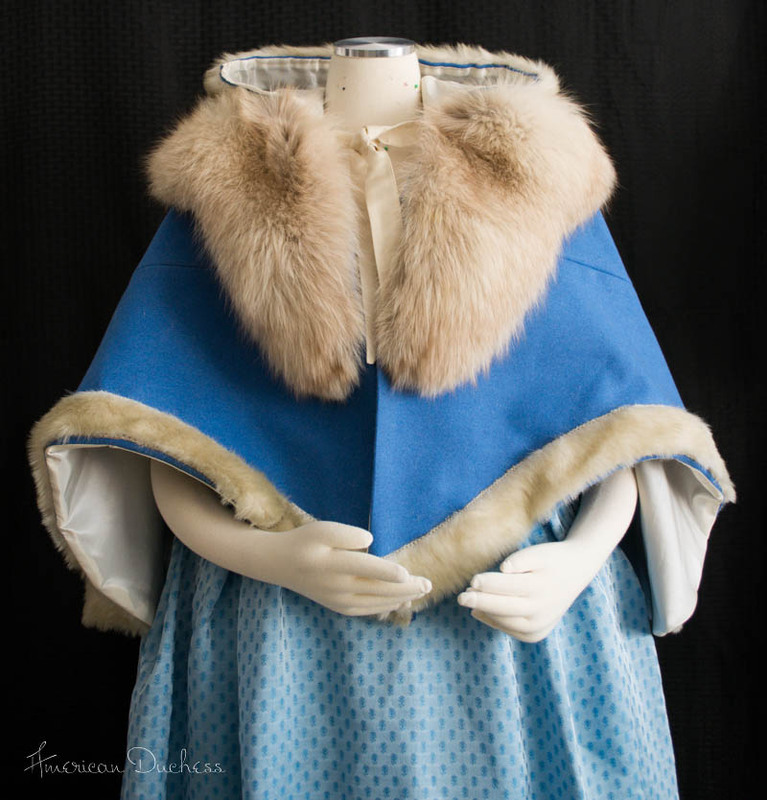 A coat and skirt, using a whole bunch of new techniques, including tailoring, working with faux fur, bound buttonholes, and working soutache braid. 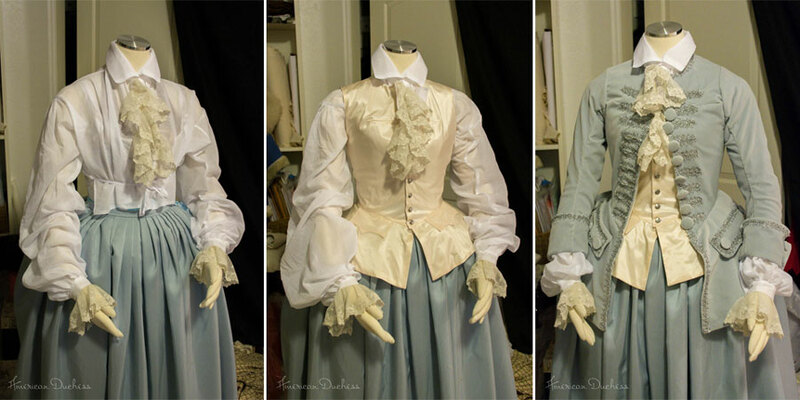 An 1860s Ballgown Bodice, to go with the purple skirt from the 1860s day dress. I'm super happy with how this turned out. It's one of the rare gowns I've made where I feel genuinely elegant while wearing it. The 8-Day 1930s Half-Norfolk Jacket. I made this just before we went to England, and tried to fully tailor it. It was so cold in England I hardly got to wear it, though! I made plenty of mistakes, but now understand tailoring much better, and look forward to the next jacket or coat project. Happy New Year, everyone! Here's to all the projects planned for 2015! I have some fanciful things in mind...what to make first!? How was your 2014? Post links to your sewing year-in-review in the comments below! Those things help immensely! I should follow suit and organize my own stash and clean up my sewing room to start 2015 right. It's always a mess! I can't wait to see what the LACMA Sacque-ma turns into, the silk is beautiful and you have lots of it! Oh wow, such a lovely handmade year you had!!! I love the fur muff, and the smooth sailing trousers. I have the pattern, I just gotta print it out! Thanks! You'll love the pattern. Very flattering and easy to make. I am also awed by your forays into tailoring--very cool! 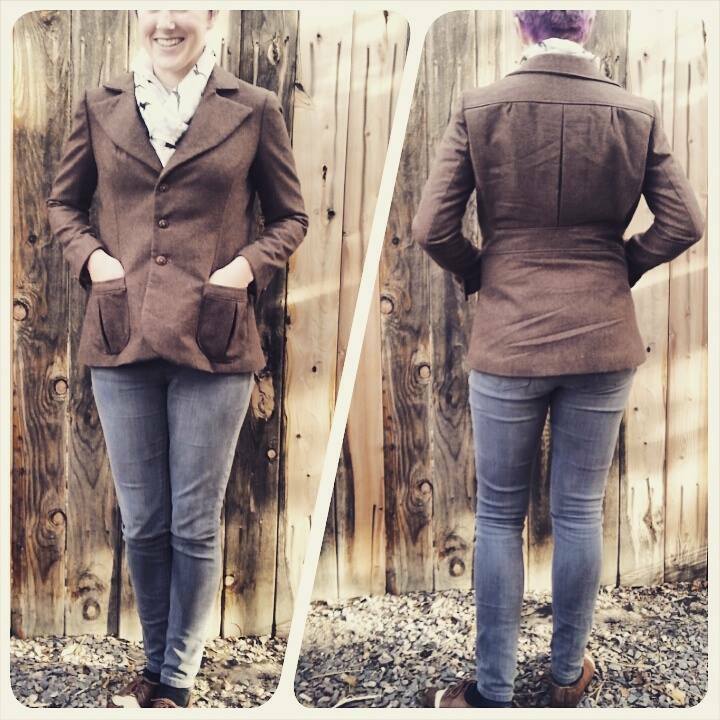 I know what ou mean about learning to tailor--I learned most of what I know from making a jacket and a coat from a Vogue pattern. Not a Very Easy, but a full-on pattern. The instructions were so detailed. I learned pad stitching, welt making, shoulder pad placement, easing in sleeves... It was just fabulous. Of course I had way more time back then! Gah, *forward to. English skills on a jellyfish level. I think all your costumes are stunning. Especially I love the riding -jacket and vest, the 1860s ball-gown and this super comfortable trousers. And now I have new inspirations and ideas. I enjoyed this post so much it actually inspired me to do my own! It took a week to get it together, but it's done now! I highly recommend giving yourself the time to do this, it feels amazing and can really be fun! I had to move my all my sewing stuff back in the summer. I'd been renting space for it all for a few years (in the back of a sewing machine shop, no less) but the building was being sold so it all had to come home (to my 2 bedroom condo where the 2nd bedroom is already firmly established as office/guest room). I had to do a big purge of stuff and then try to incorporate it all into my home without looking like it was taking over - and keep everything accessible. It was a challenge, but I managed it while enjoying the process. It can feel so refreshing and cleansing to do a good purge and re-organize! Wait, this was supposed to be a reply to an above comment about getting organized, did I do something wrong? Is it really showing up as its own comment? Hmph. I'm super late to the party, but I just wanted to say how much I love all the things that you made this past year! It's been fun seeing you venture into new eras and topics too - you are always so inspiring. Bravo!